The search for survivors in a Texas fertilizer facility explosion has so far only recovered bodies: at least 14 people died in the blast, including several volunteer firefighters. In the tight-knit town of West, the community has rallied together to help one another as donations continue to pour in. NBC's Miguel Almaguer reports. While the death toll from a horrific fertilizer plant explosion was raised to 14 Friday, after two additional bodies were found, investigators later said that the number of people who were still missing had been overblown. Earlier Friday, Sen. John Cornyn said 60 people were still unaccounted for after one the worst American industrial accidents in recent years. But officials later said that the list of missing people that had been provided was "confusing." Mayor Tommy Muska said there are "a lot of displaced people," so the list is misleading. Most -- if not all of those missing -- have been found, officials said, adding that they still do not have an accurate count of those who are still missing. 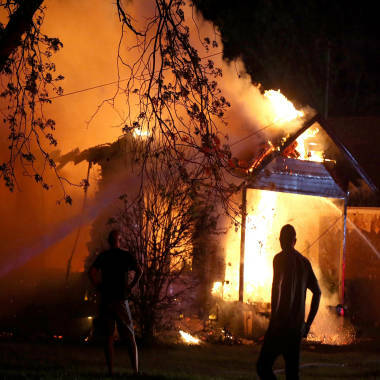 The explosion occurred just before 8 p.m. local time on Wednesday in West, Texas, which is north of Waco. The scene was described by witnesses as looking like a bombing site in a war zone. Approximately 200 people were injured and three rescue fire trucks were destroyed, Sgt. Jason Reyes Reyes said. Five volunteer firefighters and four emergency services workers are among the dead, officials said. Reyes said at least 50 homes were damaged when the plant, which sits adjacent to a residential area, exploded. He said no residents were being allowed back in the area, and thanked the search and rescue crews for their "professionalism and heroism as they try to bring closure." It's not known what caused the massive blast. The search-and-rescue effort was nearly completed on Friday, officials said. Texas Gov. Rick Perry had taken a tour of the area and witnessed the aftermath of the explosion. Helping victims of the huge ammonia explosion in the small Texas town of West brings back hard memories for a veteran Air Force aeromedical evacuation nurse with PTSD.